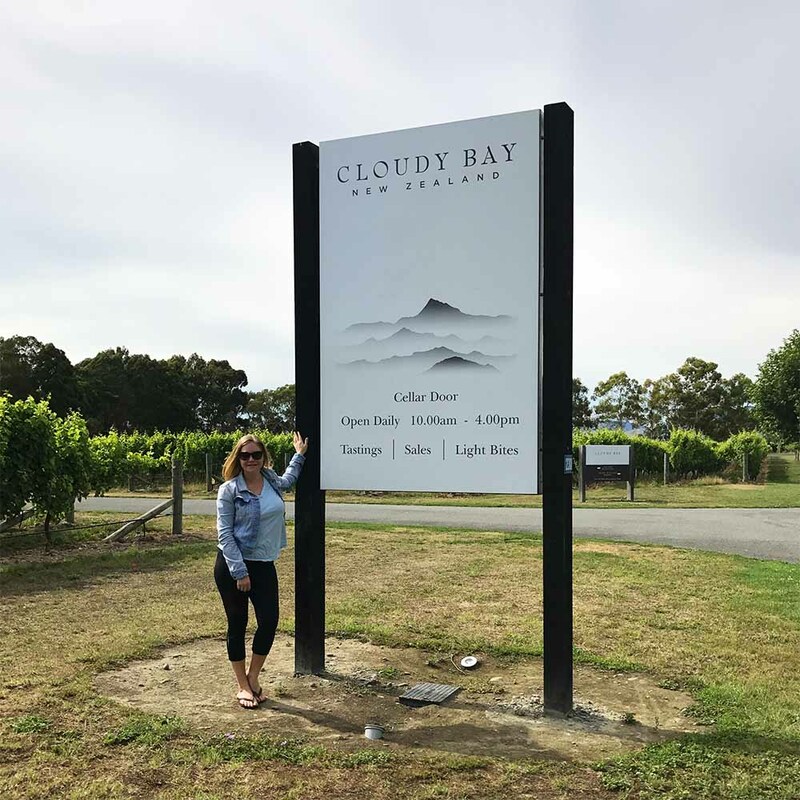 To kick off the wine tasting portion of our New Zealand adventure, we decided to start with one of the largest and most famous producers in Marlborough, Cloudy Bay. World famous for their Sauvignon Blanc, we were excited to also try some of their reserve wines that aren't available outside the cellar door. The vineyard was bought by LVMH in 2003 (the same company that owns Moët & Chandon, Krug, Veuve Clicquot, among others), and the whole experience was very polished. It's a great place to start an exploration of Marlborough. The grounds at Cloudy Bay are a lovely place to while away an afternoon. The premium tasting is NZ$25 (we shared one) and the Te Wahi Pinot Noir, which is actually grown in Central Otago, was truly outstanding. We thoroughly enjoyed sitting outside in their beautiful grounds, overlooking the vines, with a plate of freshly shucked oysters and a couple of glasses of their Pelorus sparkling. Cranky Goat cheese served with crackers and ripe kiwi fruit. YUM. We had an excellent lunch at Twelve Trees, the restaurant at Allan Scott Winery, where we were introduced to Cranky Goat - the most scrumptious goat cheese, handmade using traditional methods in the Marlborough Sounds. One of the great things about lunching at a winery is that you can try the vineyard's wines along with your lunch. Staff tend to be knowledgeable about pairings too, which is another bonus. The view from our suite at the Marlborough Vintner's Hotel, which was a great place to stay. Really spacious suites, and good value. They even had a coin-operated washer and dryer for guests to use - which is very handy when you're traveling with a toddler! Back at our hotel, I found a copy of Lonely Planet's Wine Trails: 52 Perfect Weekends in Wine Country and devoured it. I first looked up wine regions we'd traveled to in the past to see which vineyards they recommended, and was delighted to find that the author's tastes and interests were totally aligned with ours. This book then became our bible for planning day two in Marlborough, and I've since ordered a copy for myself to plan future wine escapes. I'd highly recommend this book for anyone who enjoys wine tourism, and it would make a great gift too. We started day two at Mount Riley. Their Estate Range Riesling, was a bargain at NZ$15 and delicious. Unsurprisingly, it has won numerous high-profile awards. Rosie coordinating with the gardens at Mount Riley. Next on our agenda was Villa Maria, the most awarded vineyard in the region. Here we tasted the best red of the trip, a Merlot/Cabernet Sauvignon blend grown in Gimblett Gravels, the only designated appellation in New Zealand, as well as a very balanced Botrytis (desert wine). A bottle of each went in the suitcase! Daniel Le Brun, whose family have been making Champagne in France for 12 generations since the 1780s, is the man behind No 1 Family Estate, the only specialist méthode traditionelle maker in Australasia. Given our love of Champagne, it felt fitting that this should be our next stop. Cuvée No. 1 was our pick of the two we tasted. We chose Wairau River Winery for lunch; the grounds were beautiful and the food was sensational. We ordered the most heavenly chowder, made from those local green lipped mussels. This double baked blue cheese soufflé with a rocket pear and almond salad also hit the spot. Our final stop for the day was Framingham, a truly boutique winery, who have garnered international acclaim for their Rieslings. "In a cluttered wine landscape where so many seem the same, we do things differently." We really loved their 2007 Dry Riesling, which had aged beautifully over the last decade, and their 2015 Pinot Noir was a treat too. There are all sorts of quotes printed onto the ground in Framingham's walled garden, including this one by their head wine maker. We couldn't agree more! The best meal of the entire trip was our dinner at Arbour; it was on point at every stage of the meal. I was pretty excited to discover that they offered 14 gins, six of which were from New Zealand, in addition to their extensive wine list. We tried a barrel aged gin, made by the Cardrona Distillery, which had a lovely oak-y taste you don't expect from gin. Food wise, the Marlborough caviar appetizer was a total standout, and the beef cheek and tongue main course was divine. This appetizer of local 'caviar' (roe from Marlborough salmon) with a sago wafer and creme fraiche was utterly delectable. Over the years Justin and I have visited vineyards and wine-makers in 13 different countries (and counting! ), and we felt that Marlborough really delivered. The natural environment is gorgeous, there are great dining options serving top-notch produce, and there is a lot more to discover here than just Sauvignon Blanc. To end our visit we dropped into the Saint Clair Vineyard Kitchen for lunch, and had yet another great meal, before heading off to Kaikoura. Grapes on the vine at Saint Clair Vineyard Kitchen. As it turns out, we were very lucky the road to Kaikoura was actually open. Recent earthquakes have caused a huge amount of damage to this coastal highway, and repairing the road is still very much a work in progress. Interestingly, along parts of the route shipping containers are used to reinforce the mountain and prevent further landslides. If the road had been closed, which it was only days before, we would have had to take the inland route which is many hours longer. 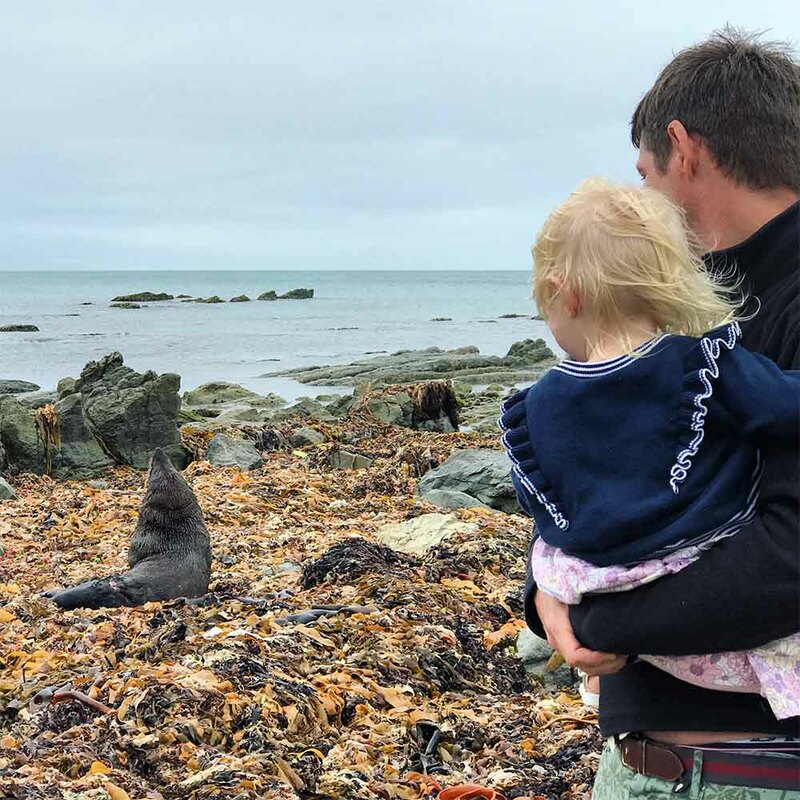 Wild seals on the Kaikoura peninsula. After a few sunny days in wine country, the heavens reopened over Kaikoura. I'm so glad we decided to do our dolphin experience in Picton, because no boats were taking people out in Kaikoura during our stay due to the rough seas. It's a good reminder that when you're traveling in pursuit of natural wonders, you can't control mother nature. But that's also half the adventure, because sometimes you end up seeing things you could never have planned in advance. We braved the elements to walk out on the Peninsula, which is home to a large seal population, and we were able to get up close to the seals without getting in their way. It's such a privilege to be able to see wild animals like this, in their unspoiled natural habitat. Driving back to our hotel we spotting a sign for a sheep shearing demonstration. We figured what the hell, presumably it's indoors! It turned out to be a blast. Who'd have guessed it? The farmer was an absolute hoot, and entirely entertaining on the subject of sheep. Rosie was also responsible for feeding Sparkles the lamb a bottle of milk, which totally made her day. Rosie and Justin feeding Sparkles the lamb. The following morning we set off for Christchurch, the final leg of our road trip. I'd read about a special winery in Waipara, exactly on our driving route, that practices organic and biodynamic wine-making and separates all of their grapes by vineyard to focus on terroir. Of course we had to make a stop there for lunch! Situated just an hour from Christchurch, Black Estate Winery is a must visit for anyone in the region. Lunch at Black Estate. New Zealand lamb is arguably the best in the world, and this salad of organic lamb with bulgur wheat, spring greens and salsa verde really showed off the country's top quality produce. I didn't know what to expect from Christchurch since the devastating earthquake that hit the area in 2011. Even though seven years have passed, the impact of that quake is unmissable, with the collapsed Cathedral highlighting the scale of the damage to the city's historical architecture. ChristChurch Cathedral, seven years after the earthquake. Despite the tragedy caused by the earthquake, Christchurch oozes character and charm. I thought this elephant mural was so beautiful, echoing the city's slow and steady path to recovery. There are many examples of beautiful 19th century architecture across the city, among other more contemporary styles, and urban art has flourished in the open spaces that await repair. 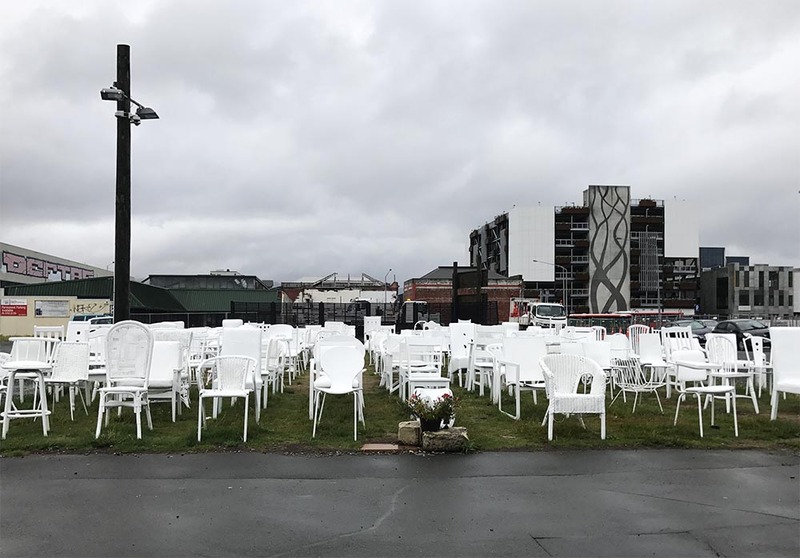 This temporary art installation of 185 empty chairs, reflects on the lives lost in the 2011 earthquake. One afternoon we had a fun tour of the city on the Heritage Tram. Rosie loves all forms of transport, and this was her first time on a tram. Tick! We trundled to a stop on New Regent's Street, and we had to disembark. Honestly, this is one of the most adorable streets I've ever seen. Rows of little pastel-colored, terraced shops were built here in the 1930s, in Spanish Mission architectural style. The Heritage Tram outside the historical buildings on New Regents Street. The area is pedestrianized and was the perfect spot to kick back at a retro-styled cocktail bar for a drink. Sitting outside The Last Word on New Regent's Street, waiting for our swanky cocktails. The following day we explored the city on foot. The Botanical Gardens were glorious (and next time we'd love to go punting on the Avon River), but on this occasion we were headed to the Canterbury Museum. The rain doesn't stop this family! To top off a pretty awesome vacation, there was a National Geographic exhibition at the museum showcasing their 50 best photographs of all time. Rosie admiring one of the world's most famous photographs, 'Afgan Girl' by Steve McCurry. Thank you New Zealand. What a trip!